Members of the Iraqi army prepare a sheet to block the view of an ISIS sniper during an operation to reclaim the last remaining districts of western Mosul from the Islamic State. 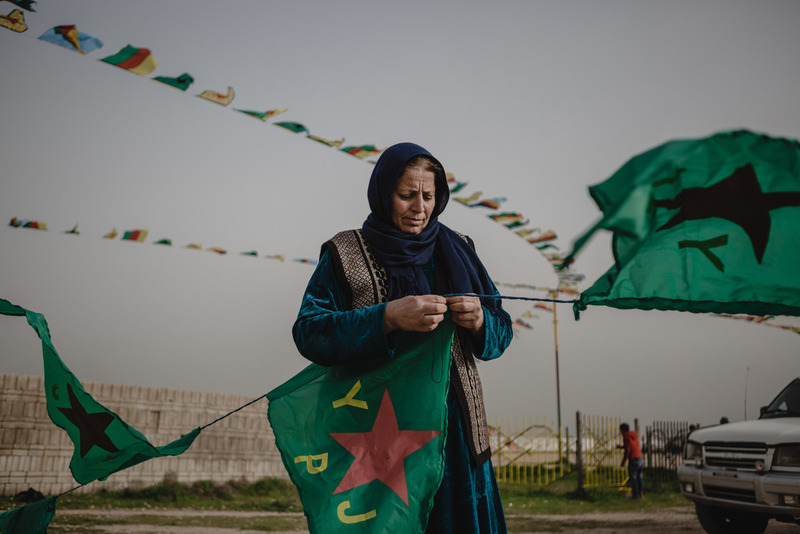 A women sews Kurdish People's Defence Units (YPG) flags in Amude, Syria. The flags are for Newroz celebration that are being organized by the Democratic Union Party (PYD). PKK forces survey a street destroyed by the war. A young boy who lost his hand due to fighting in Mosul waits with his family to be relocated to one of the displaced people’s camps south of Mosul. His mother says his hand was injured by a mortar falling in western Mosul and that Islamic State doctors treated him. Members of the Iraqi army fortify a new position inside the remains of the Old Mosul Hotel in al-Shifa neighborhood during a newly launched assault to reclaim the last remaining districts of western Mosul from the Islamic State. Thousands of Yazidis gather at the religions holy temple of Lalish for the lighting of the candle celebration for Yazidi new year. 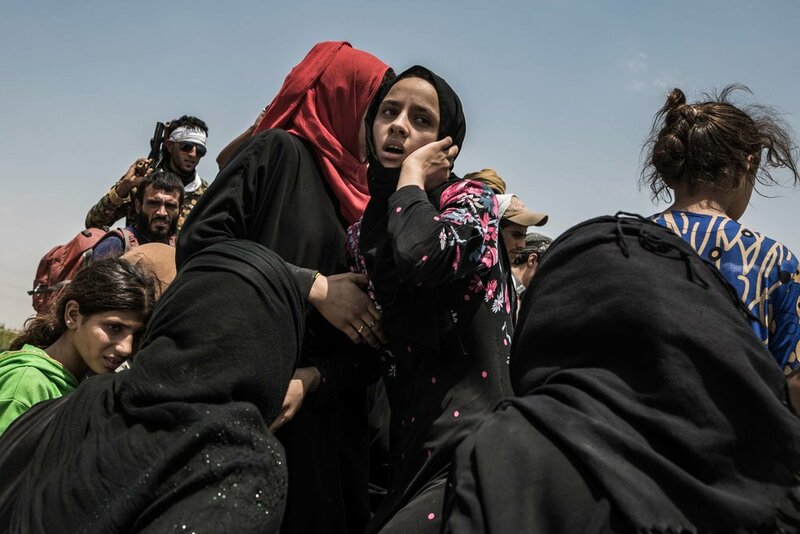 After fleeing Raqqa, about three hundred civilians wait for Syrian Democratic Forces to return their identification cards and for transportation to refugee camps. Weapons investigator Damien Spleeters of the organization Conflict Arms Research examines the inside of one of the many Islamic State-manufactured rockets found inside a family home-turned-weapons-warehouse in Tal Afar, northern Iraq. ISIS’ network of munition factories have produced two main types of rockets: a small rocket about 2.5 feet in length and a longer one (picture) measuring almost 6 feet. These products are made from scratch using a combination of steel, plastic, and aluminum, each one adhering to a standard weight and diameter. September 25, 2017. Andrea DiCenzo for WIRED Magazine. Peshmerga soldiers wake up in the morning after the two battle with ISIS militants to take back the city of Sinjar. A women holds her child while looking back towards the sea she and her family just crossed from Turkey. Migrants react after arriving on the shore of the Greek island of Lesbos. A dazed child receives medical treatment at an Iraqi army medical unit after fleeing heavy fighting in al-Zinjili neighborhood. June 03, 2017. While the Islamic State sieged Sinjar mountain, those captured have reported they were divided into groups. If adolescent boy had armpit hair they were told to join their fathers and older brothers, driven to nearby fields, and executed. Younger boys would be forced to convert to the Islamic State’s strict version of Islam. Family and community members mourn the death of Mahmoud Abdullah Adwan, 21, who was shot and killed in the morning by Israeli Defense Forces in Qalandia Refugee camp, West Bank. Due to lack of space inside the camps and over-crowding, some displaced Yazidi’s live in semi-built houses and structures in the valley’s outside the camps. A young Syrian girl with face paint plays in the playground built for the camp.